It highlights homework-specific concerns and considers two principal solutions. Firstly, support initiatives from schools and communities. Secondly, improved homework design, aimed at attracting greater student interest and promoting communication within families. Recommendations for practice and future research are also discussed. A political analysis shows that current confusion about homework might stem from a tension between two prevailing ideologies, one stressing students’ improved achievement in competing economies, and the other privileging collaboration between the school, family and community. This book considers how both teachers and parents can ensure a balance between the child’s school life and his or her overall development. Certain community resources are available to parents and students, but these in no way absolve parents of the responsibility to maintain an interest in their child’s school activities. 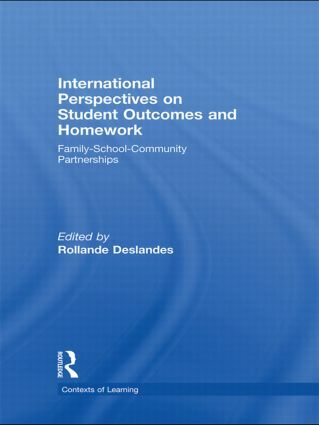 International Perspectives on Student Outcomes and Homework proposes ideas and actions of relevance to everyone interested in the issue: school administrations, teachers in training and in practice, parents, and researchers eager to contribute to the advancement of knowledge in the field. It is a perfect companion to International Perspectives on Contexts, Communities and Evaluated Innovative Practices, also edited by Rollande Deslandes, and published simultaneously by Routledge. Homework in Denmark: What Kind of Links between Family and School?